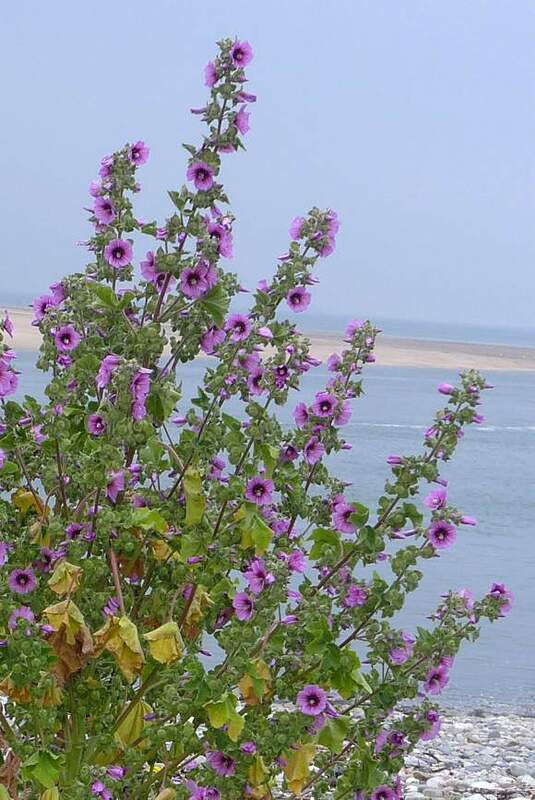 Grows up to 3m tall especially near the sea and usually either in the high-tide zone or just above it. 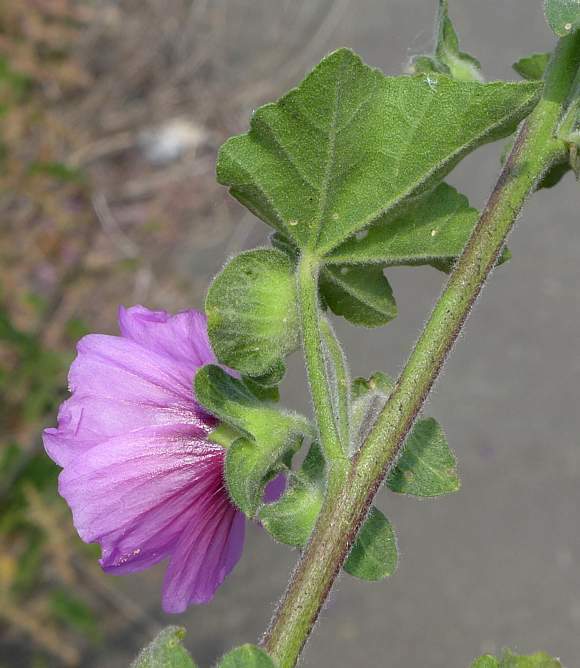 Rarely found inland, but when it is it could be confused with the escaped Garden Mallow (Malva × clementii) aggregate of species. 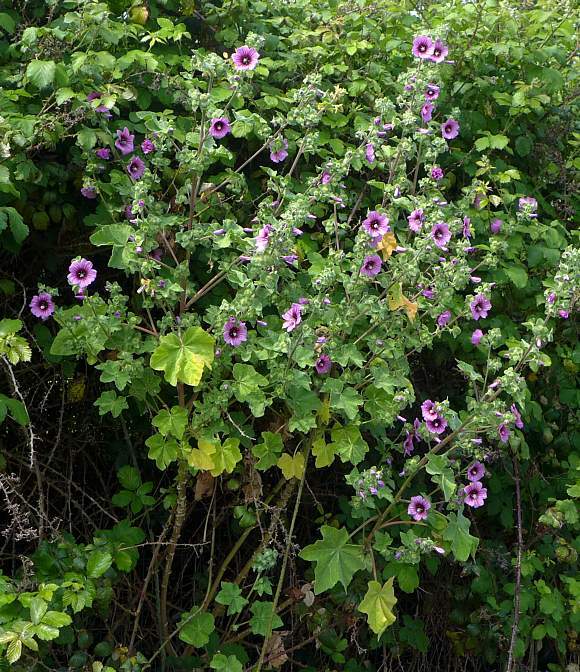 Preferring the salty environment nearer the coast to deter many potential competitors from growing (but not all) Tree Mallow has to have some defence against excess salt in its diet. It does this by excreting salt through glands on its leaves. Even its seed cases are protected from salty sea water by an impermeable outer case which allows it to remain viable for many years, perhaps long enough to reach the shores of other lands especially those around the UK coasts, but it does prefer the warmth and dislikes the cold. 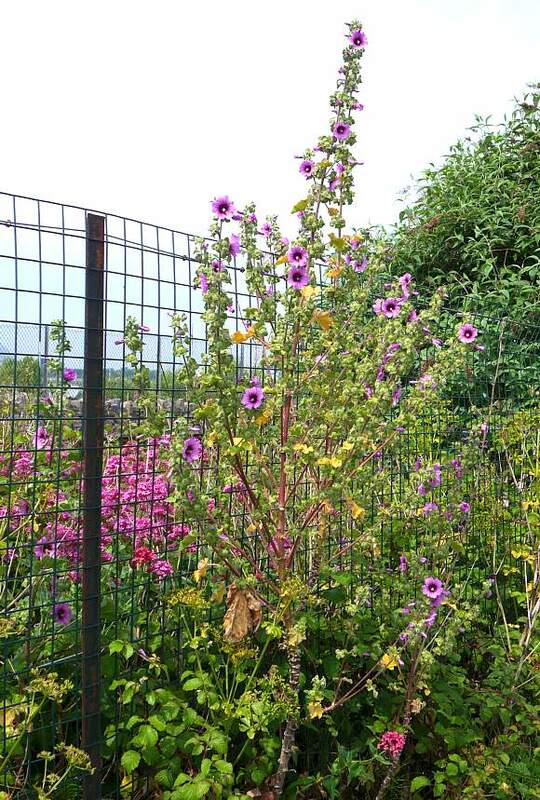 It is a shrubby biennial or perennial. 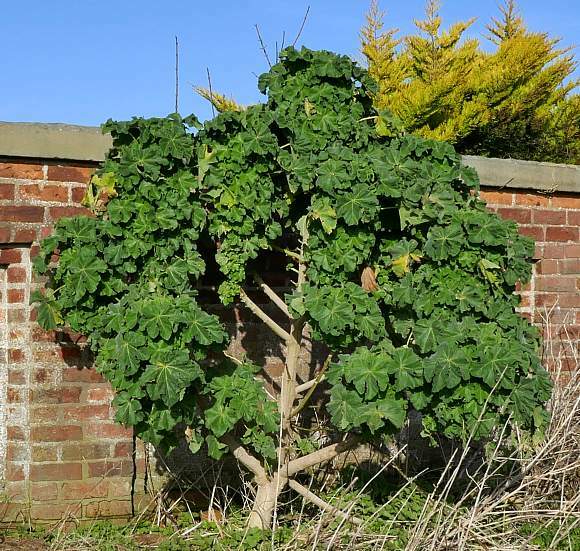 This specimen looks sturdy as if it might have been growing for longer than two years compared to specimens just slightly more inland (shown below) which have far thinner trunks. The tree is very shrubby with many branches, all seemingly flowering. 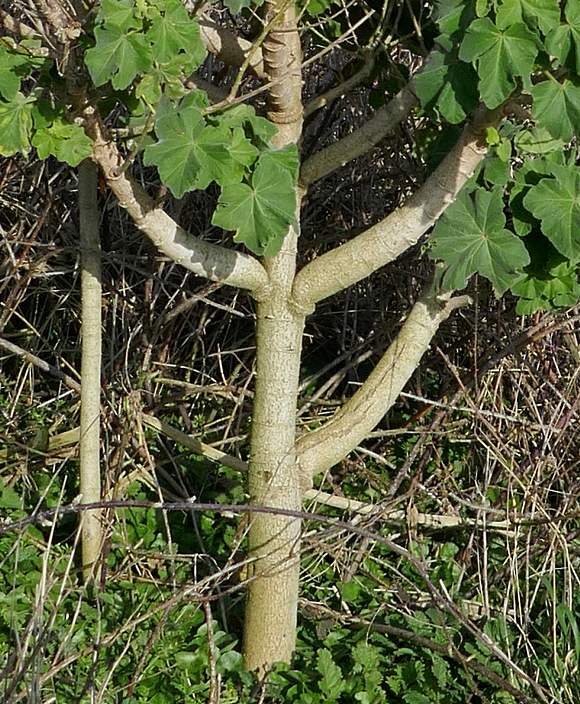 Another specimen, this one lacking the strongly-upwardly curved branches. A less-sturdy specimen a little further from the salty sea-water but the ground will still certainly be subject to salty sea-spray. Perhaps that is why these specimens have a much thinner bole with no need to store much fresher rain-water? Or, with it being a biennial, they could just be only up to 2 years old. Don't they grow fast! Conwy mountain is in the distance over the estuary and the railway line to Llandudno protects it from most of the ravages from the sea. 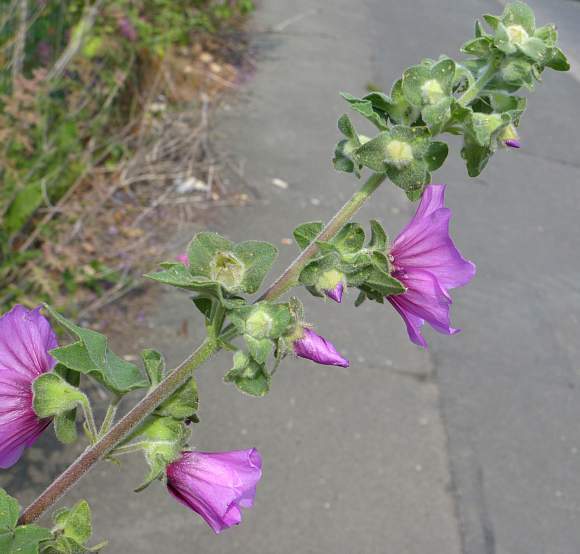 The flowers are in sparse racemes up the stems. Leaves palmate with between 5 to 7-lobes. 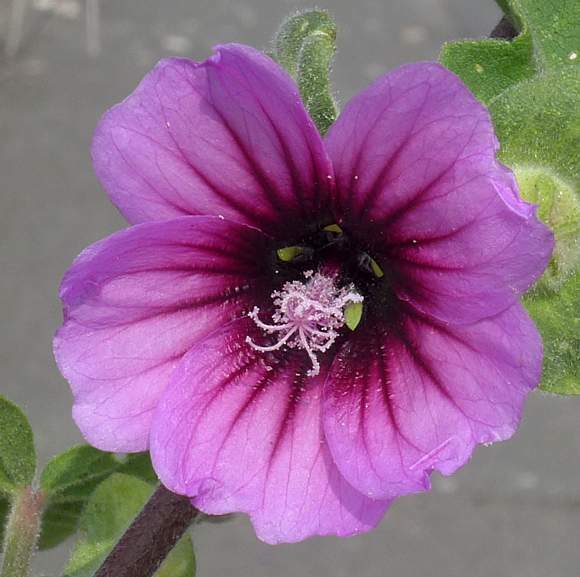 The flowers have little or no gaps between the darker-coloured pinkish-purple petals with a dark indigo centre which are 14-20mm long, un-like the much rarer Smaller Tree-Mallow (Malva pseudolavatera) which has wider gaps and slightly shorter petals 10-20mm long which are a paler lilac colour and lack the darker centre. Leaves shallowly lobed with 5 to 7 lobes, the two rear ones shorter. 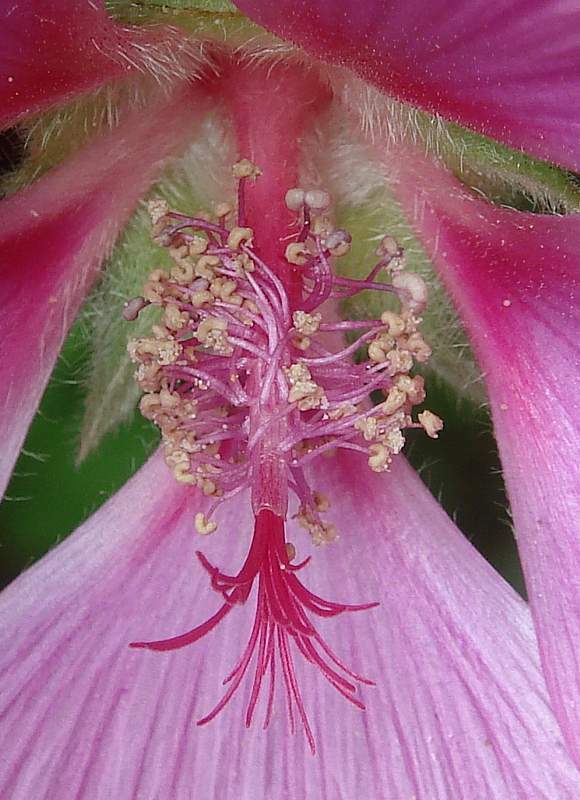 The flowers flare out from within the hairy calyx and epicalyx. 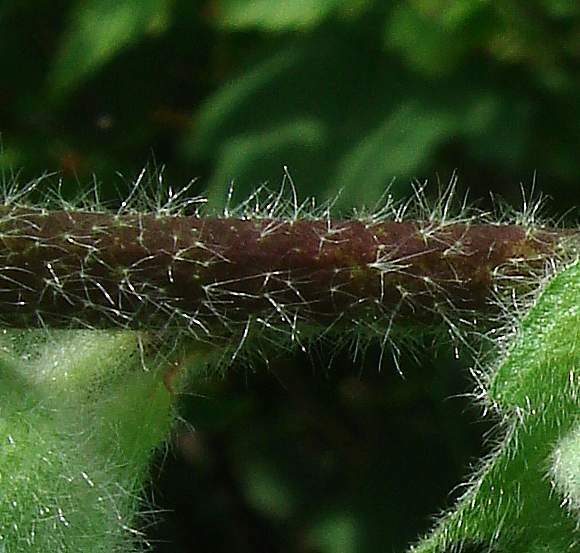 The young stems are hairy too. 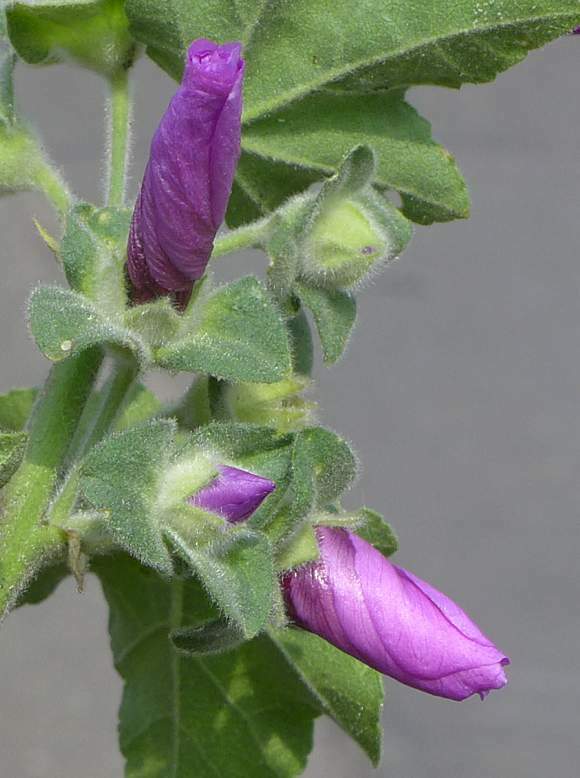 The flowers are initially spirally wrapped into a cone which unwraps. All the younger parts are hairy. A developing fruit is just above centre. Petals usually recurved backwards slightly. 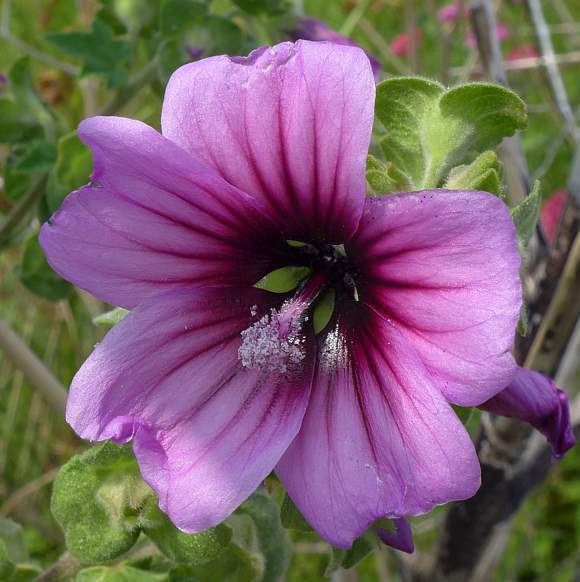 Unlike Smaller Tree-Mallow the central area is indigo coloured with darker stripes on the petals. 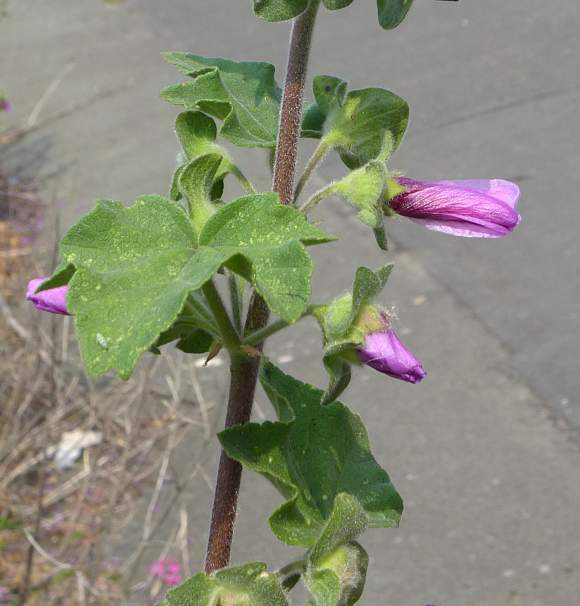 Mallow are rather different regarding sexual organs, there is a central tube up the centre of which is the style (not visible in this photo). Around the tip of the tube numerous stamens grow bearing pale lilac-coloured pollen. 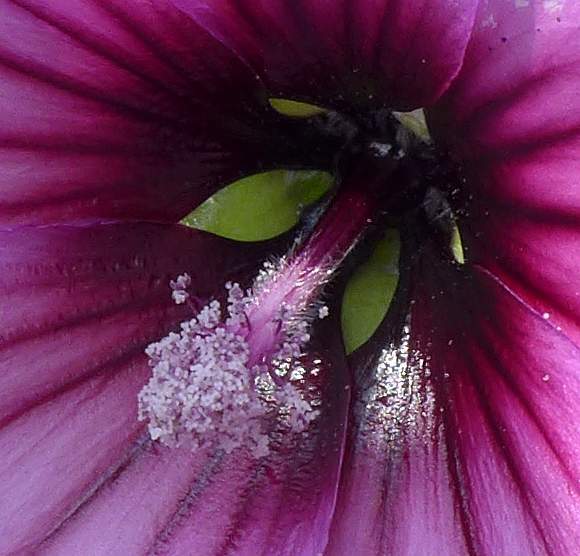 The central style is visible in this specimen as well as the pollen-bearing stamens. The stigma has a white style split into several curved sections. Epicalyx has 3 lobes and is larger than the calyx just visible behind the flower. 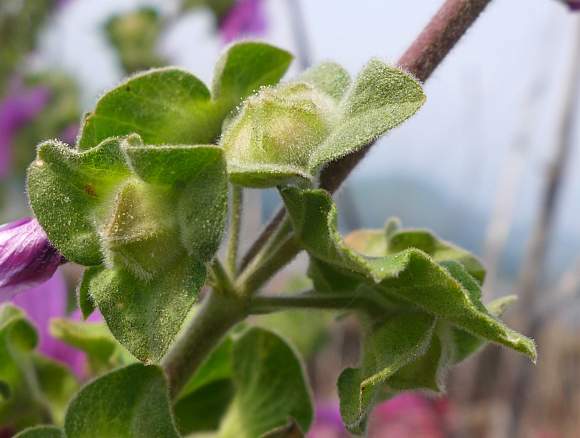 An un-opened flower showing the 3 larger open flaps of the epicalyx and the 5 closed flaps of the calyx. All hairy. 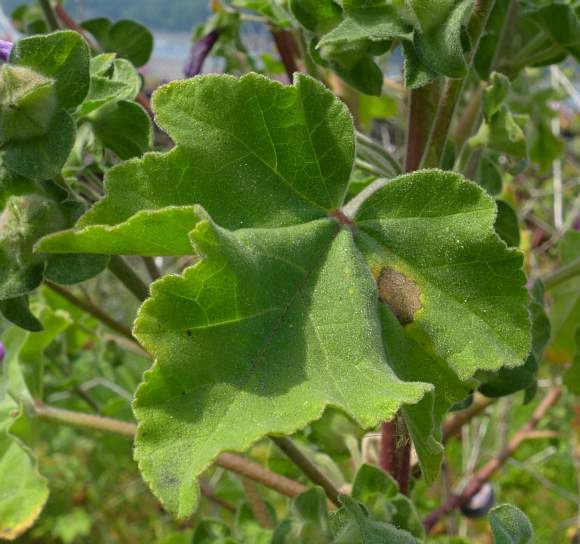 Both Smaller Tree-mallow and Tree Mallow have some stellate (star shaped) hairs on the young parts of the plant. 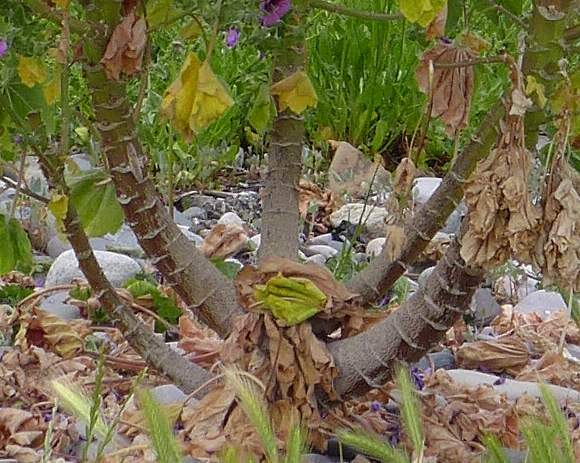 The trunk of this specimen is quite striking with its symmetrical U-shape and a bole which thickens rapidly nearer the ground. 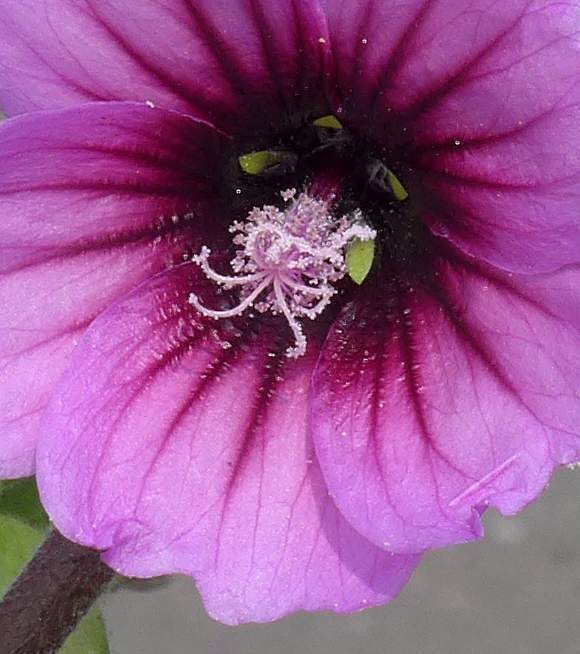 The hemi-circular paler ridges are also distinctive. The lower parts of the bole(s) are woody and reddish-brown, but the upper parts are still green. 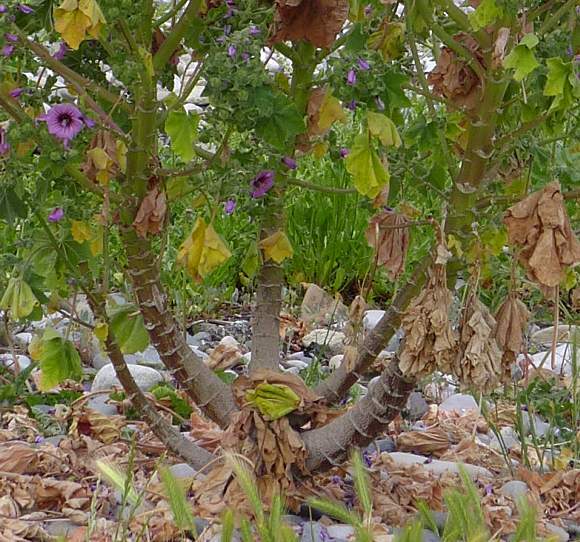 It is obviously suffering - the lower leaves are drooping like handkerchiefs, some turning brown, and many have fallen on the surrounding beach pebbles and boulders below. In the foreground is Sea Barley . 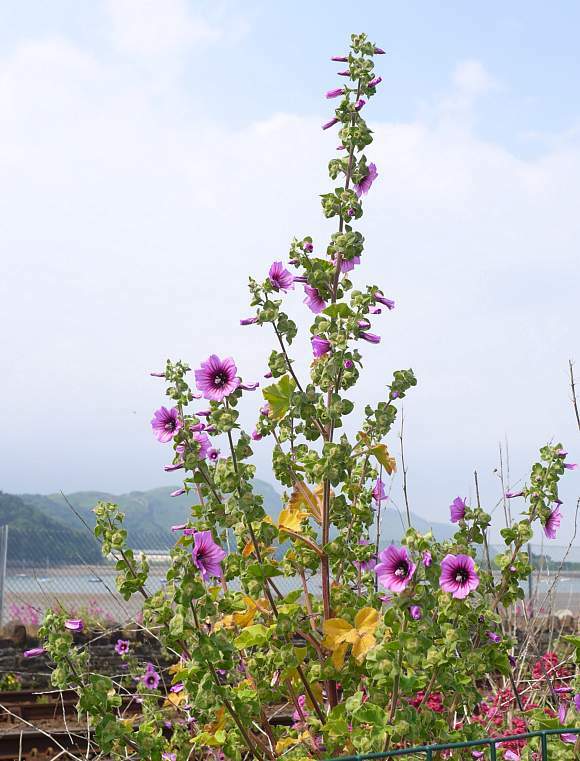 Living on the sea-front subjected to twice-daily tides your Author speculates that this specimen may have to eliminate salt at a much greater rate than the specimens further inland, and that this might account for its more succulent appearance? This specimen also exhibiting the strongly upwardly-curved branches. 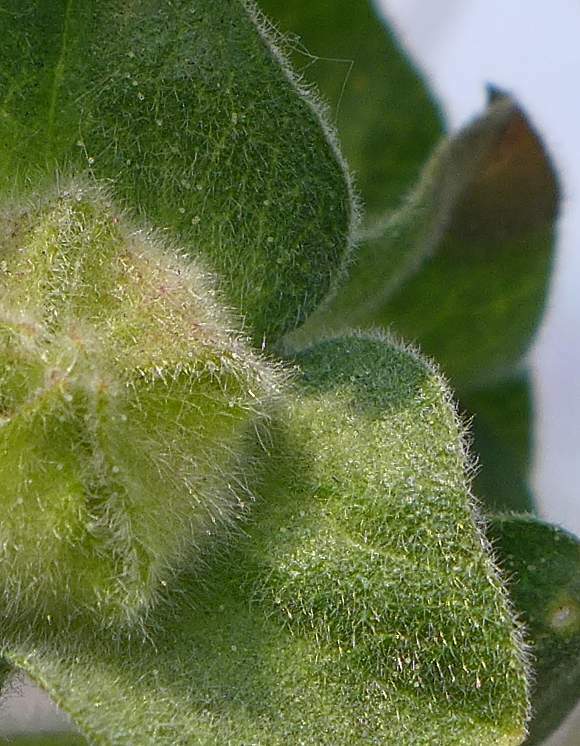 Similarly this young hairy stem from Gargen Tree-Mallow , like those of Tree Mallow and Lesser Tree-Mallow but probably slightly different in ways unknown, have some hairs that are stellate: star like - they branch (at the base) into several, like a star. 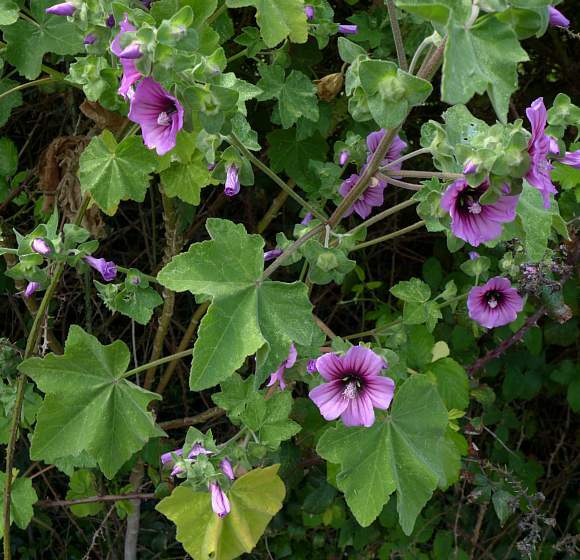 Easily mistaken for : Garden Tree-Mallow (Malva × clementii) (formerly Malva thuringiaca) aggregate of species, a perennial horticultural shrub which has larger and paler flowers and only one at each leaf node but which grows inland only and is not salt-tolerant. Your Authors only lasted 3 or 4 seasons before dying. 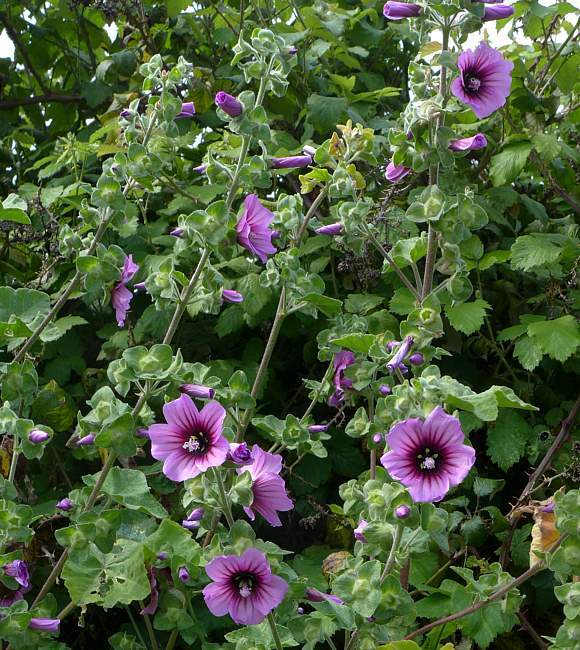 Some similarities to : Lesser Tree-mallow (Malva pseudolavatera) but that has paler petals that are lilac and which lacks darker stripes and indigo-coloured blotch in the centre which also inhabits rough ground near the sea. It is a lot rarer occurring in the Scilly and Channel Islands. 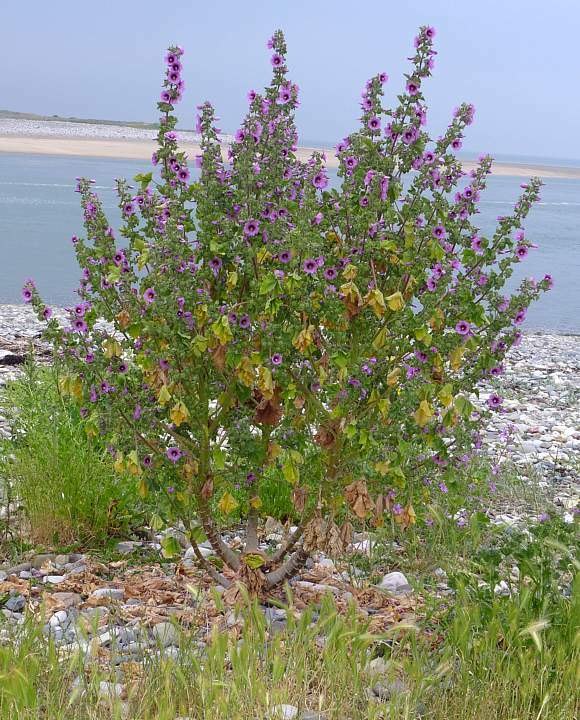 It is a short native Tree which is tolerant to sea-water salt preferring to grow near the sea or on the beach near normal high tidal. 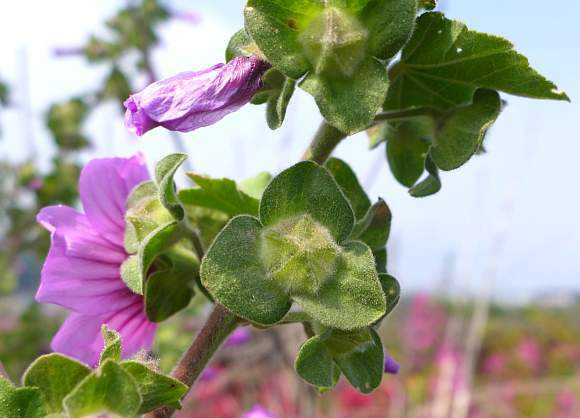 It grows on waste ground, rocks, and the bottoms of cliffs. It seems not to grow at all far from the sea.